Golden Voyage is beloved by fantasy film fans for its fabulous creatures animated in stop-motion by Ray Harryhausen, but its hallmark monsters aside, this is one strange movie. The story is a sort of stately parade of wonders with a plot that makes sense only in the terms of dream logic. Sinbad (John Philip Law, bland but with a nice smile) happens upon one-third of a magical golden amulet, and thereafter is led by visions and visitations on a quest for … what? Some goal that, despite a superfluity of prophecies and portents, is never really clear. Wealth? Power? Experience points? Maybe it’s the latter, because Sinbad and company are basically a Dungeons & Dragons adventure party, his crew reminiscent of the clichéd squad members in every war movie, only with Arabian Nights names like Haroun and Omar. They’re joined by Caroline Munro as Margiana because she’s the hottest thing in harem pants, and because she has an eye tattooed on her hand that Sinbad saw in a dream, so she must come along because Fate or something. The party is rounded out by a grand vizier who conceals his features behind a golden mask because they were destroyed by a fireball from the evil wizard Koura. This vizier joins the quest because somebody has to utter portentous warnings and explain What It All Means. Which brings us to the aforementioned evil wizard Koura, and here’s where the movie gets interesting. This sorcerer, Sinbad’s arch-rival on the amulet quest, is played by Tom Baker—the Fourth Doctor!—who’s almost unrecognizable in a black turban and face kerchief. But he does more emoting with just his eyes than the rest of the cast put together. Koura is the wizard who magically animates all the creatures that bedevil Sinbad and company, but every time he casts a spell he visibly ages, marching toward death, and soon it becomes clear that he wants the magical amulet’s prize because it will restore his lost youth and stave off his suicide-by-sorcery. This makes Koura the only character in the picture with clear and comprehensible motives, and Baker plays him with such energy and verve that about halfway through the film I found myself starting to root for the villain. Koura won me over in the scene where, with a mandrake root, alchemy, and a dollop of his own blood, he animates a tiny, winged homunculus, and suddenly we see that the putative villain is the real heart of this fantasy: passionate, he breathes life into inanimate matter, creating wonder before our eyes. Yes, you’ve got it: Koura is really Ray Harryhausen himself, literally pouring his life into his creations. 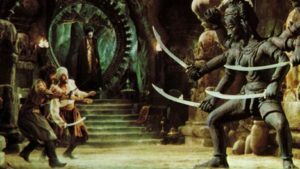 This is even more clear when Koura animates a statue of the six-armed goddess Kali, making it dance for him purely so he can revel in his artistry—or rather Harryhausen’s artistry, for whether dancing or wielding six swords against Sinbad, the slyly smiling Kali is a masterpiece, so good it’s easy to forgive the stretches where the film falls flat. The script is by Brian Clemens, the English screenwriter behind most of the best moments of the British Avengers TV show, but this outing is weak work, recycled adventure-film tropes and Orientalist clichés. The dialogue is studded with phony wise sayings like “You cannot pick up two melons with one hand,” in which you can hear the snotty British intellectual sneering at the Wisdom of the East. It’s embarrassing. Eventually the quest leads to the long-lost island of Lemuria, which is cluttered with ruins evoking every ancient Asian culture at once: India, Tibet, Cambodia, China, and so on. It’s meant to imply that the questers have discovered the source of all the cultures of the Mysterious East, but it feels more like the message is all those bally foreign temples look alike to me, eh, what what? It doesn’t help that the Lemurians, when they find them, are a tribe of green-skinned ooga-booga cannibals with skulls on sticks. Ouch. But those animated monsters, though! So fabulous. Plus there’s some wonderfully lush music by Miklós Rósza, who contributed one of his last great film scores, and a couple of epic dungeon crawls that I guarantee helped inspire Gary Gygax. Despite its lapses and eccentricities, as fantasy films go, Golden Voyage is still almost indispensable.